The weather will be mixed today but it takes a turn for the worse tonight and tomorrow as Storm Hannah moves in from the Atlantic. Heavy bursts of rain spread across most areas and winds strengthen. Gusts of up to 70mph are likely in coastal parts of Wales and south western England. Next week the trend is towards more settled conditions as high pressure comes back into play. Friday is off to a mixed start. Wet weather is affecting parts of southern Scotland as well as Wales and the south west. Elsewhere it is dry. Through the day the band of rain in the west steadily moves northeastwards. Ahead of it in eastern England a few heavy showers could break out. 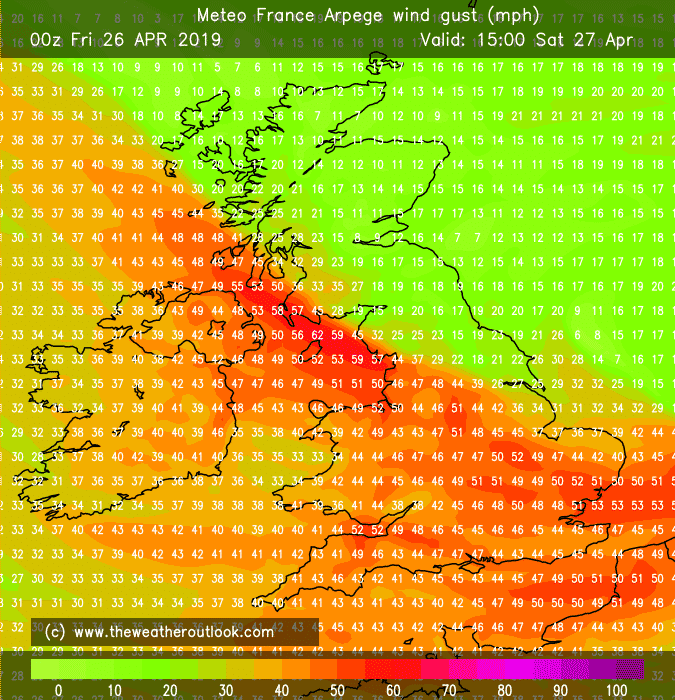 Drier conditions follow but in the afternoon winds begin to strengthen and another areas of rain reaches the southwest as Storm Hannah approaches. Temperatures range from around 12C (54F) to 16C (61F). Check the rain radar for the latest view. Tonight wet weather pushes northeastwards with only northern Scotland remaining dry. It also becomes windy in Northern Ireland and the southern half of the UK. Gusts of up to 70mph are possible in the south west with 40mph to 55mph elsewhere. Tomorrow morning heavy showery spells of rain affect much of the country. In the afternoon they increasingly become confined to the north and east as Storm Hannah pulls away into the North Sea. It remains very windy. Drier conditions return eastwards overnight. Sunday starts with shows in the north east. A band of rain is also likely to be affecting the south west and through the day it slowly pushes northeastwards. However eastern and possibly central areas may remain dry. It will be quite cool. 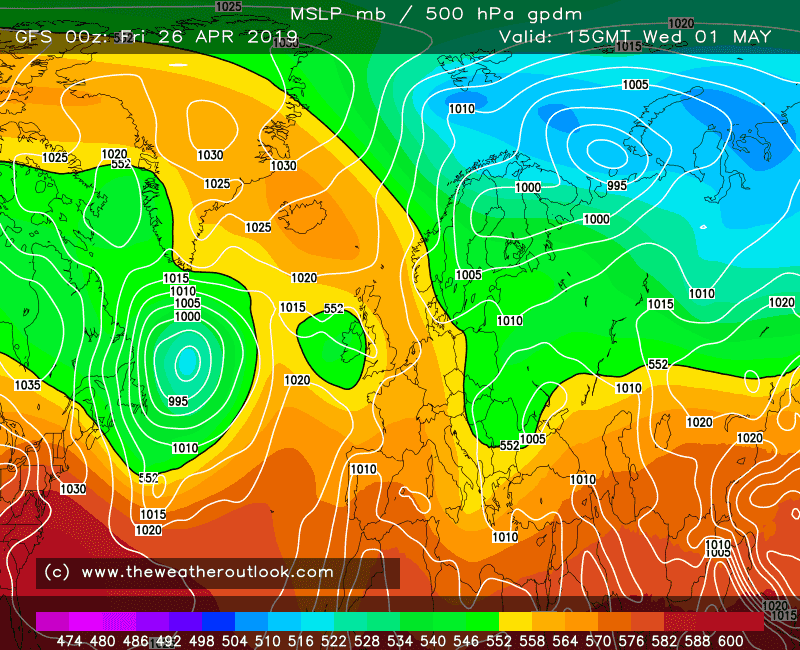 Next week high pressure is expected to be centred to the north and there is uncertainty about its influence on the UK. On balance it is likely to bring more settled conditions but there is a risk of showers at times. Computer models are suggesting the likelihood of drier and warmer weather for the Bank Holiday weekend. If you would like to join the TWO community please see how to register for the forum. People with all levels of meteorological knowledge are very welcome to apply. After a dry and warm start it turns cooler and unsettled. View latest GEFS.